Some of the richer, more colorful writing about the Veblens was uncovered recently via google. Many people who are unfamiliar with Oswald Veblen will recognize the name of John von Neumann, whom IAS director Robbert Dijkgraaf recently described as "perhaps an even greater genius than Einstein". 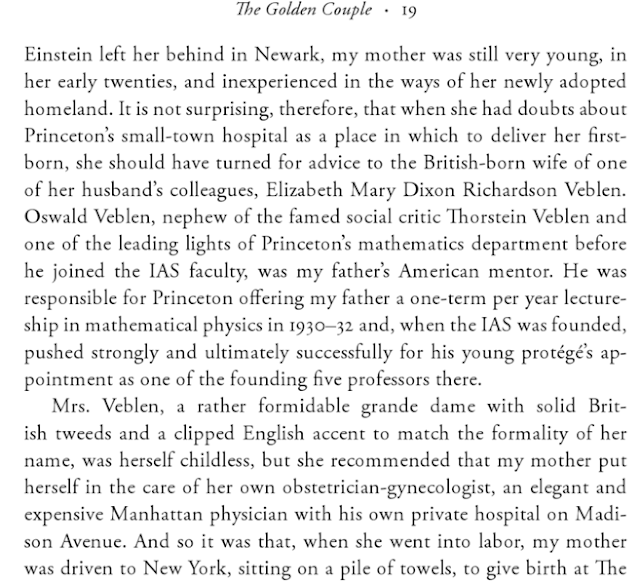 Veblen had a keen eye for mathematical talent, and in both of these accounts is credited with bringing von Neumann to Princeton. 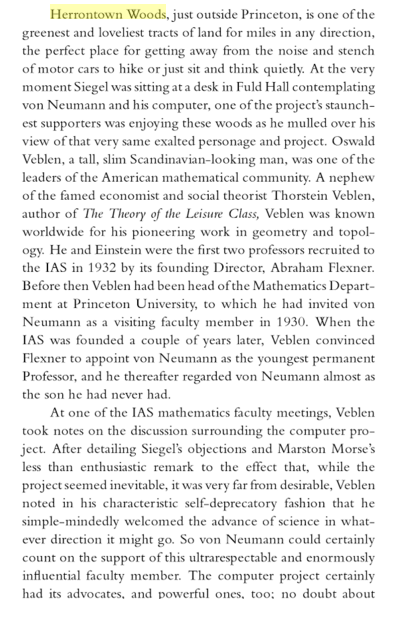 Veblen also lent vital support to von Neumann's proposal to build one of the world's first computers at the Institute for Advanced study in the 1940s, when many scholars viewed such a machine as an intrusion. 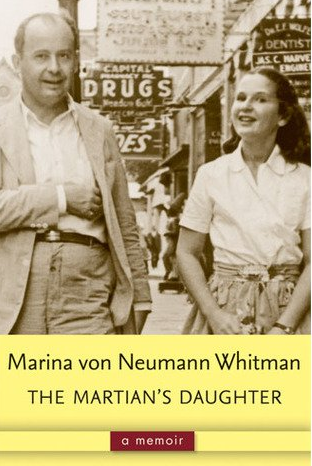 In one, "The Martian's Daughter: A Memoir", von Neumann's daughter Marina Whitman describes the role the Veblens played, not only in furthering her father's career but also in her birth. 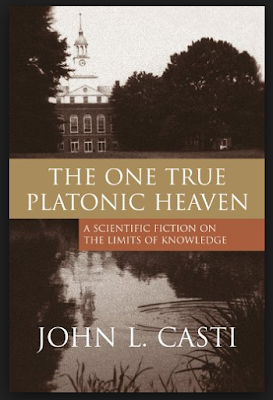 John L. Casti, in his book about the Institute for Advanced Study, "The One True Platonic Heaven", describes Oswald Veblen's support for von Neumann, first by getting him a position in the Princeton University Mathematics Department, soon thereafter advocating successfully for his appointment to the IAS, then supporting von Neumann's controversial project to develop a computer. Presumably, in a book that intermixes fiction and fact, the excerpt below sticks to the facts. Two phrases in Casti's description catch the eye for anyone seeking to understand Veblen and his legacy. One is that Veblen "regarded von Neumann almost as the son he had never had." The Veblens had no children, and one interpretation of his enormous generosity towards young scholars is that he was channeling a nurturing instinct that had no familial outlet. The other is Casti's description of Veblen as "ultrarespectable and enormously influential". The more one learns about Veblen's legacy, the more one wonders at his invisibility--the multiple examples of how his name goes unmentioned, whether in the hallway history exhibit at the Institute, the literature offered to tourists at Old Fine Hall (now Jones Hall), or as founder of Princeton's open space movement. Even the house he donated for public use has been left boarded up and threatened with demolition, despite a nonprofit having been formed to repair it. One theory, conjured early on in this research, was that he had a dark side that made people reluctant to give him credit for all the good he had done. This, it seems, is not the case. A closer look reveals a visionary, a man ahead of his time, who appears to have been on the right side of every issue, whether fighting early on against discrimination towards jews and African Americans, saving land from development, freeing scholars to pursue their research interests, or supporting the development of computers long before their potential was clear. I was Mrs Veblen's paperboy for a year, 1965-1966. I never received payment from her but I did not care. She never could find cash and instead tried to pay me with old magazines or with little boxes of matches. I often sat with her in her living room and listened to her stories. At first I found her difficult to follow, to understand. Soon I looked at the pictures on the mantel. Although only 11 or 12 I easily recognized pictures of Woodrow Wilson with, as became evident, Mrs Veblen and her husband and others. She seemed to always have a fire going in the fireplace. The home had the aroma of a hunting lodge. I loved visiting with her when I made my bi-monthly visits to get paid. She was lonely and eager to have company. She was wonderful to talk to and I loved her voice and accent. I knew she must be a kind person. I hope the Veblen home is preserved. It is a remnant of an era long gone. Years later, after a career in the Marine Corps and federal law enforcement, I look back and wish I had more conversations with Mrs Veblen. In email correspondence, Mr. Donahue shared more of his memories of Elizabeth and the house. This would have been five years after Oswald died, and gives a portrait of an elderly woman who had had a remarkable, active, highly social life, now with unaccustomed solitude and the challenges of aging. She had two large, stuffed upholstered chairs in front of the fireplace. They faced the fireplace and its adjacent wall, not at a 90 degree angle, but closer to 45. She would sit in one and I in the other and she would tell stories. There was a dark oriental rug and bookshelves. There were lots of books in the room, and a small table next to her chair with a cup and saucer. She liked to drink hot tea and many times offered me tea. Her train of thought was hard to follow and she did not always speak clearly. She did most of the talking. She always had a shawl around her shoulders and she moved slowly, stooped over, and shuffling when she walked. Because there was always a fire in the fireplace, the home smelled like the hunting and fishing club my grandfather belonged to in the 1950s and 1960s. It smelled smoky, but was not overpowering. It was a good aroma. A warm, cozy aroma. I think that I mentioned the photos on the mantel above the fireplace. As an eleven year old, I had already read a lot of American history and recognized group pictures of Woodrow Wilson with a handful of other people. I remember asking Mrs. Veblen why pictures of the former president were on the mantel and she said that she and her husband knew Mr. Wilson. I was impressed! Prior to my middle school years I spent time in Herrontown Woods. My friends and I found several streams and flooded areas that provided good frog breeding grounds. I remember finding masses of frog eggs in several places where the water was deep and slow moving. We went home and read about frogs and returned a week or two later to find the tadpoles. It was a cool place to learn about nature. As a boy I liked to listen to my grandparents tell stories, so it was easy for me to sit with Mrs. Veblen. My visits sometimes lasted 20 or 30 minutes, certainly not the norm for a paperboy attempting to get paid. Usually, transactions with my other customers lasted a minute or two on a cold front porch or doorstep. After my one year as an eleven/twelve year old paperboy, I knew that the business world would not be my livelihood. Although she did not pay me, I did not have the heart to cut off her paper subscription. As a child, I did not know much about psychology or aging, but I could tell Mrs. Veblen was not totally coherent. I suppose now we might call it dementia. But I did recognize that she was kind and needed companionship. I knew that I spent way too much time at her home, but we both enjoyed each other's company. When the spring of my 7th grade year arrived, I had to quit the route. In 1966, the Trenton Times was an afternoon newspaper and I had to choose between playing catcher on the Princeton Middle School baseball team or being a paperboy. I chose baseball. Occasionally, in my secondary school and college years I wondered what happened to Mrs. Veblen. Then a few weeks ago I read in the Town Topics online about a group trying to save the Veblen home. From there I found the blog. I hope your group is able to preserve the homestead. It provides a connection to the past, to a special time in our country's intellectual history, and the history of Princeton.